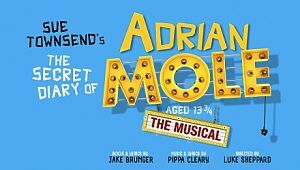 The hit Curve Leicester and Menier Chocolate Factory production of The Secret Diary of Adrian Mole aged 13¾ the Musical will run in the West End at the Ambassadors Theatre this summer, opening on 15th June and running until 12th October. It originally ran in Leicester in 2015 and again at south London's Menier Chocolate Factory in 2017. The musical is based on Sue Townsend's series of novels about the young intellectual Adrian Mole as he grows up in the 1980s. Set in 1980s Leicester The Secret Diary of Adrian Mole Aged 13 ¾, follows the daily dramas and misadventures of Adrian’s adolescent life. With dysfunctional parents, ungrateful elders, a growing debt to school bully Barry Kent and an unruly pimple on his chin, life is hard for a misunderstood intellectual who is only 13 ¾. . . Directed by Luke Sheppard, the musical has book and lyrics by Jake Brunger and music and lyrics by Pippa Cleary. Choreography is by Rebecca Howell, set and costume design by Tom Rogers, lighting design by Howard Hudson, musical direction by Mark Collins, musical supervision and orchestrations by Paul Herbert and children's casting by Jo Hawes.Casting for the West End run is to be announced. Buy Tickets for The Secet Diary of Adrian Mole .